Which is the best hotel with five stars in Madrid? If you are going to Madrid and want to live in luxury, then you should book a five star hotel. But, which is the best hotel in Madrid, in other words, the best five star hotel in Madrid. There are quite a lot of five star hotels in Madrid, so it is not easy to pick the best one of all of these. However, there are some hotels in Madrid which are better than others, also among the five star hotels, so here we will focus on two such hotels which we believe to be the very best five star hotels, thus the best hotels of all hotels, in Madrid. This is a beautiful five star hotel, with lots of splendid user reviews spread around on the Internet. They have free wireless Internet, a nice SPA area with fitness room and massage treatments available, and if you are hungry they have two nice restaurants inside its doors. It is located a bit outside the inner center of Madrid, not far from the Prado Museum and the El Retiro Park, and if you want to watch Real Madrid, it is easy to get to Santiago Bernabeu from Hotel Villa Magna. Would you like to eat your breakfast with beautiful live music in the background? Then visit the Westin Palace Hotel located in the museum area of Madrid, near Prado, Thyssen Bornemisza and Reina Sofia. 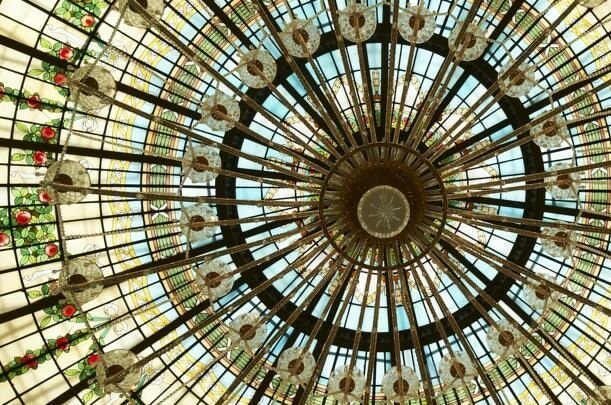 The interior of the hotel is really beautiful, and especially the dome is something that will take your breath away. The location of the hotel is better than Hotel Villa Magnas, but unfortunately the wireless Internet is a service that you need to pay extra for. Where should I live in Madrid? If you want to live in the nicest five star hotels, choose one of the mentioned hotels. If you prefer one of these based on the descriptions given by us, go for that. If you are still insecure, check the prices of both and book a room in the one that has the best prices. If you have any further insight on the subject, or maybe you have experience from one of these, or some other hotel in Madrid, write a comment! « Where can I watch Real Madrid matches online?